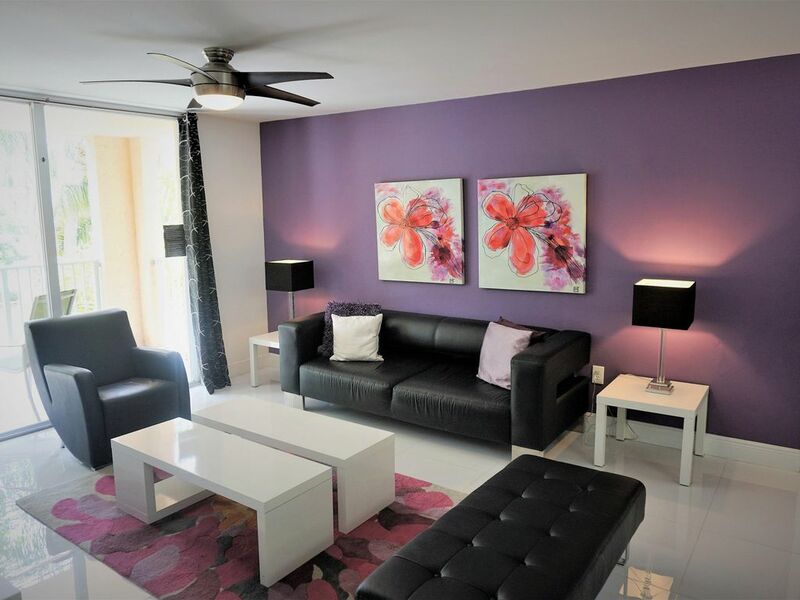 Our apartment will provide you and your family the perfect vacation rental right in the heart of Aventura. Our 3 bedroom/2 bathroom unit will comfortably fit a family of eight including children or a group of six adults. -MASTER BEDROOM: Large suite with a king size bed. Comfortable mattress with springs and double pillow top, private bathroom, walk-in closet, 42' Plasma w/ remote control and Cable TV, luggage holder, security safe, table lamps, alarm clock. -BEDROOM 2: Two twin beds, night stand with table lamp, dresser, luggage holder and closet. -BEDROOM 3: Two double beds, baby crib (upon request), nightstand with table lamp, chest of drawers, luggage holder and walk-in closet. Living Room area includes a 55'' flat screen TV with Home Theater system and U-verse cable TV, dining area with a round table and comfortable dining chairs, counter top with adjustable bar stools, Free WIFI internet, free local calls, balcony access with 2 chairs and table. We also provide you an umbrella and 2 beach chairs for you to carry to the beach. Are you travelling with a big group? The Yacht Club at Aventura is a safe, 24hr gated community with excellent amenities for the entire family. It offers a resort-style large heated pool and Jacuzzi, fitness center, two tennis and basketball courts, indoor racquetball, BBQ area, marina access, and a business center with free internet, printer, fax machine and an ATM available. The Yacht Club condominium is located in the quiet residential area of Aventura, walking distance to the Safra Synagogue & around the corner from the Aventura Mall, the largest shopping mall in Florida. Its great location provides very easy and convenient access to South Beach, Sunny Isles, Miami Beach, Hollywood, and Fort Lauderdale area. It is also near the Gulfstream Village Park and Casino, Waterway Shoppes, Bal Harbour mall, plenty of restaurants, supermarkets and much more! Get your work-out on at the Yacht Club Gym, or go for a nice evening stroll in the 3-mile jogging and exercise trail going around the prestigious Turnberry Golf Course, located right outside the residence. Enjoy our beautiful, fully renovated, and very well equipped apartments in one of the most sought-after areas in South Florida. We strive to make your stay enjoyable and to help make a memorable vacation in our beautiful Miami. Stay with us and you will not regret it! We charge a one-time cleaning fee of $130. We charge $75 condominium fee which includes the use of the amenities and a decal with barcode for your car which allow you to enter the condominium without having to wait in line. When booking your vacation through the VRBO booking located at the top right of the page, you will be prompted to read our cancellation policy and our house rules. Once you have accepted the policies, we will review the reservation specs and make a decision as to accept or reject the rental. Once we have accepted, the first payment of 50% of the cost will be processed. 21 days before the arrival date, you will need to complete the second payment which will be the other 50% of the cost. Upon us receiving your second payment, we will send you a Condominium Registration Form through e-mail and we ask that you send it back at your earliest convenience. This is done in order to comply with the condominium rental policies. Upon your arrival at our apartment, we ask that you provide us with credit card information so that we can hold it as our security deposit. The credit card will be charged in the case of damage property or serious violations of apartment policy. The time of check-in is 4PM and time of check-out is at 11AM. We may be flexible if we do not have another renter coming or leaving in the same day. Hello and welcome! We are Mario and Marcela. We moved with our family from Argentina in 2003 and we bought our first apartment in the States at The Yacht Club in Aventura. There, we formed our first home in the US and lived in that apartment for four wonderful years. During our time at the Yacht Club, we especially enjoyed the great amenities and of the excellent Aventura area. We spent many days at the pool, had Argentinian-style BBQs, played tennis in the evening, and sat out on the deck fishing and watching the boats go by on the canal. Now, we moved to a larger apartment to accommodate our family, but we are still nearby! We currently have three nicely renovated and decorated rental units at the Yacht Club and we are very excited to have you stay over! We love what we do and we are always available to assist our guests. We will be happy to help you in planning your stay and we strive to help make your stay a wonderful, relaxing one! Email or call us with your questions. We can speak Spanish, Hebrew, Portuguese, and English! At the beginning of 2013, we inaugurated our second rental apartment at the Yacht Club. We decided to invest in this new property because of the great success and experience we have renting our other property in the floor below. During the past 5 years we have received many families from all over the world who come to vacation in Miami. We have gained tons of experience and we know what your needs are when you are travelling. We enjoy having people stay in both of our units, and we try to make your vacation an unforgettable experience! The actual condo was fantastic! Has all the amenities we could have wanted for a family of 5. My kids had their own huge rooms and big closets and the apartment was clean and updated and great. The community pool had lots of rules that annoyed me as a mom wanting her kids to have fun. No noodles or pool toys or balls at all! The security guards came out to yell at us several times as did the old people in the pool area. Also you can’t put towels down at the pool chairs to reserve seats. We did this one morning and the security removed them and put them with all our towels and books and bags in a pile in the lost and found. And finally they enforce the rule of no hot tub use under age of 12. These rules annoyed us and made it frustrating a bit. Clean and Comfortable! Great pool! Close to everything! The property was exactly as described, modern and clean. Amenities were good, tennis courts onsite as well as a swimming pool. Only minor downside is the location next to the mall, traffic can be pretty busy at times and time to downtown Miami is about 30mins. Beautifully decorated, extremely clean, easy access to everything. Had a great stay. Mario was wonderful. He kept in constant communications with me before I got here, and when I got here made sure I got set up with IDs and security access. I would highly recommend this place to everyone. We loved the condo. The apartment is great, clean and spacious. The host was very kind. We enjoy our stay there. I stayed here with my husband, parents, and two boys (ages 5 and 2). The layout was perfect for us -- the master bedroom and bathroom on one side of the living room/kitchen and two bedrooms and a bathroom on the other. The owner provided a Pack 'N Play for us to use during our stay. We especially appreciated having the in-unit washer and dryer and loved spending time at the Yacht Club pool. Both the condo and complex were very clean and kid-friendly. Would definitely recommend!